It's have been a long time since I last wrote to you, but we have been so busy with our new organisation, Galgos.dk - we have had a stressfull, but very good start here in Denmark. On our homepage, we have presented 4 podenco's from you; Fernan, Tomas, Sara and Lucas. Are any of them still for adoption ? Untill now we havn't had any interested in adopting them, I think it's because podencos are almost unknown here in Denmark. 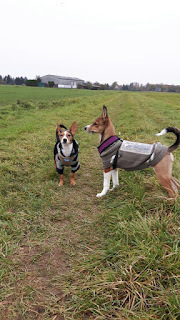 But now we are starting to get some asking about the dogs, and we have had 2 podenco-adoptions from other shelters. So maby it will be better in the future. Bambi and Laya sends a lot of big hugs to you, they are both doing very well. 2 weeks ago, our organisation had a stand on a big indoor dog-fair. 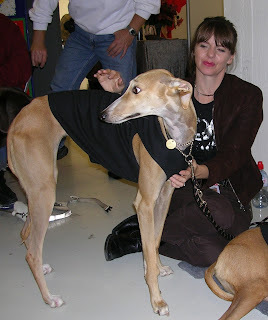 We brought Bambi and we had the luck to meet Victoria Stilwell, who have never met a Galgo before. I have attached a picture of them. We have a skelter in Seville with many galgos who we safe from being killed or hung up. We prepare them for transport to Holland or Germany where we try and find families who want to adopt the galgos. We would need more families who could adopt the galgos. Can you help us?